Negotiating Committees from Raytheon Missile Systems of Old Pueblo Lodge 933 in Tucson, AZ, and Rugby Manufacturing of Local 2525 in Fargo, ND, got ready for their respective rounds of contract negotiations at the unique Negotiation Preparation for Bargaining Committees program at the IAM’s William W. Winpisinger Education and Technology Center in Hollywood, MD. Both groups face potentially difficult rounds of negotiations and their respective committees came up with strategies to change bargaining history, map a new direction for relations with their companies, put better language in their contracts and build solidarity in the bargaining units. The Raytheon group was joined by Local 933 DBR James Watson. Local 933 represents Fire Department employees who protect the employees, product and capital at the Raytheon Missile Systems plant in Tucson. The current contract expires February 2011. “This course was an incredible experience, from working as a team and formulating strategies to establishing networking opportunities, the journey was amazing,” said Local 933 member Paige Day. Also taking part in their own Negotiation Preparation course were Local 2525 negotiating committee members and DBR Shannon Stucker who are preparing for talks with Rugby Manufacturing in North Dakota. Rugby employees manufacture dump truck bodies and hoists. Local 2525 is under their first IAM contract and will be negotiating for their second contract. The current contract expires January 21, 2011. Members of the Local 2525 negotiating committee came away impressed with the class and the results. 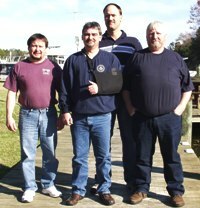 “One of the best classes I have ever taken,” said Local 2525 member Allen Lunde. For information about the Negotiation Preparation class, contact the Winpisinger Center at 301-373-3300.